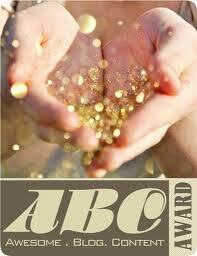 When I was at Adrian’s housewarming party in January, I promised Mrs. Oh that we would have dinner one day. 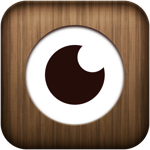 I saw Groupon’s offering sometime in February 2014, although not knowing if Chao Yue Xuan would make the mark, I bought the deal for 4 persons. I kept my fingers crossed that the food would be tasty like Ah Yat’s. The value of the meal for four was S$260 for a 7-course dinner but we paid S$29.80 nett each person not inclusive of the miscellaneous charges i.e. tea and pickles which will be charged on the dining day itself. 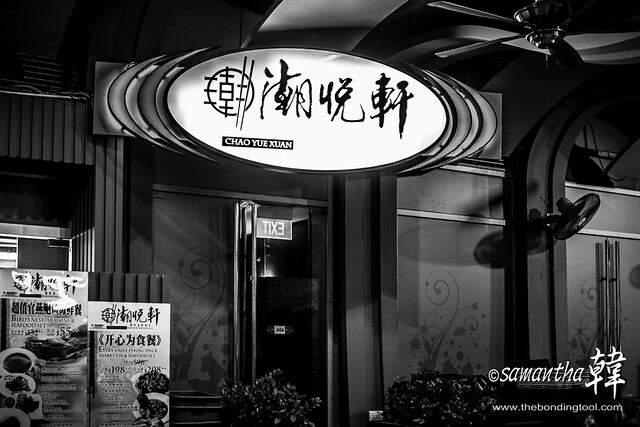 Chao Yue Xuan Seafood Restaurant, one of Ah Yat’s Group of Restaurants, specialises in authentic Teochew cuisine and seafood. 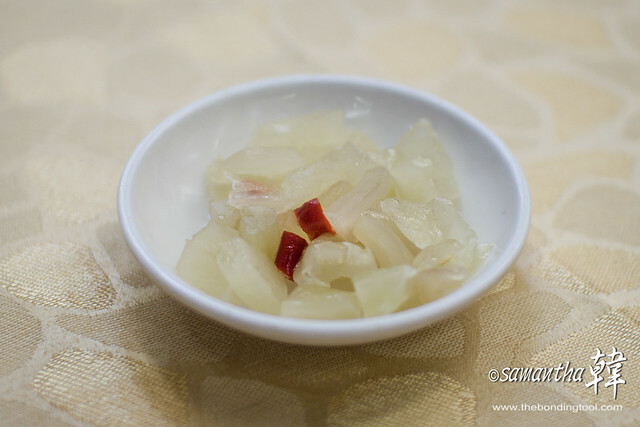 Crunchy sweet, savoury and not too sour pickles offered as appetiser. 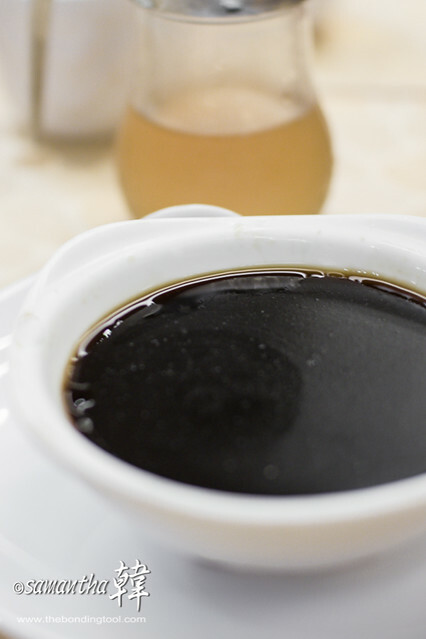 Whenever I visit Teochew restaurants, this tea is served before meal begins. 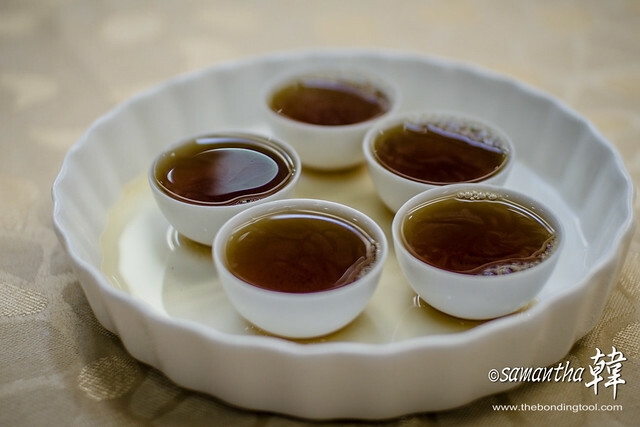 It is different from the tea that we order to partake our meals. I supposed this is meant to perk up your appetite. Smoked Duck as appetiser and 1st course of our meal. Nothing extra-ordinary here except the onions were crisp and sweet without being “sulphuric”. 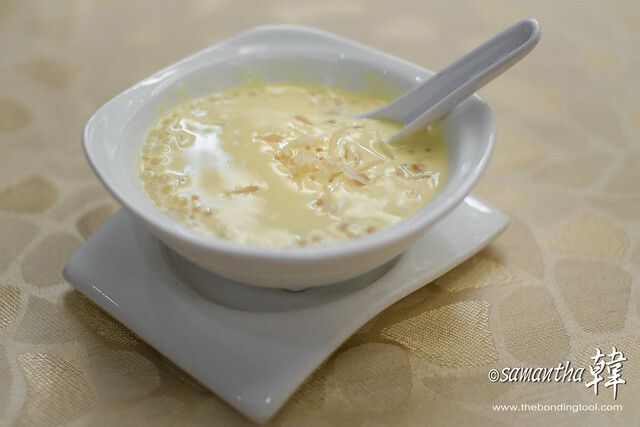 The soup was bubbling hard like a volcano erupting when the server brought them to the side trolley. This is an individual serving. 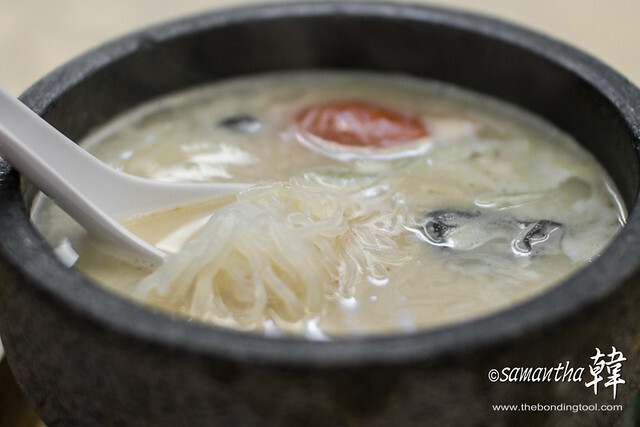 There’s a bundled glass noodles that’s different from the tanghoon (mungbean noodle) we usually eat. The noodles were thicker and its al dente texture slightly chewy. 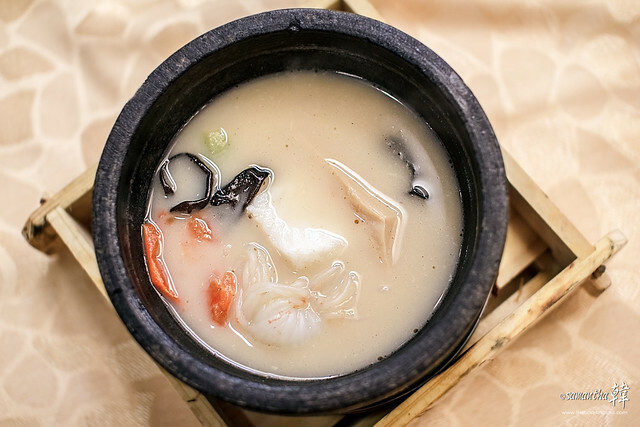 There’s a piece of abalone, 2 thick slices of very fresh Garoupa, some Black Fungus, lettuce and tomato in tasty broth. 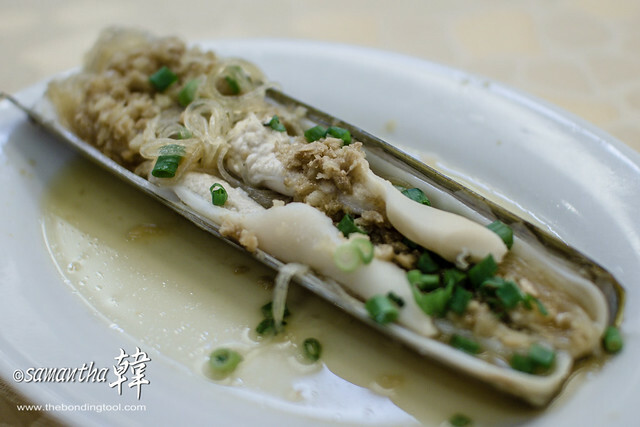 Bamboo Clams steamed with mungbean noodles (the usual type of tanghoon that I was describing in the soup photo above). The manager of the restaurant came over with two serving spoons and scrape them off the shell for easier consumption. 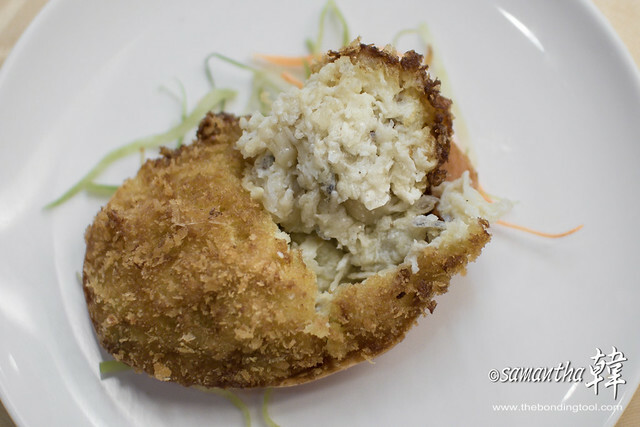 Crabmeat, some seafood and egg white are used in this dish. Although this was packed solid with unadulterated ingredients and very tasty, I found it a little dry. Nai Bai served with minimal fuss. 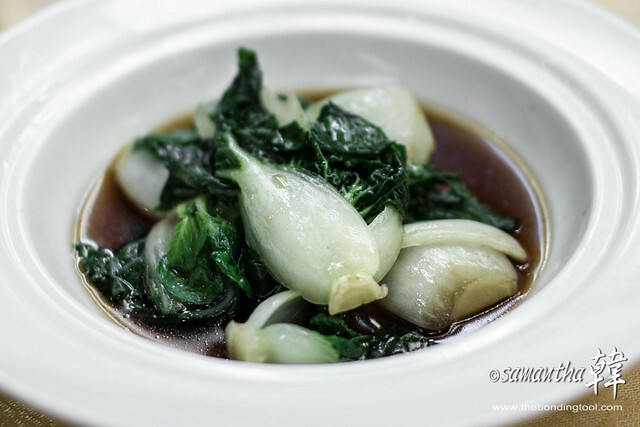 This vegetable is one of Adrian’s favourite contrary to his mom’s liking. Adrian was too full by then while Yap and Adrian’s mom were struggling with their veggies. I preferred Nai Bai with sambal but I finished my share as I remembered how little vegetables there was in my recent diet. 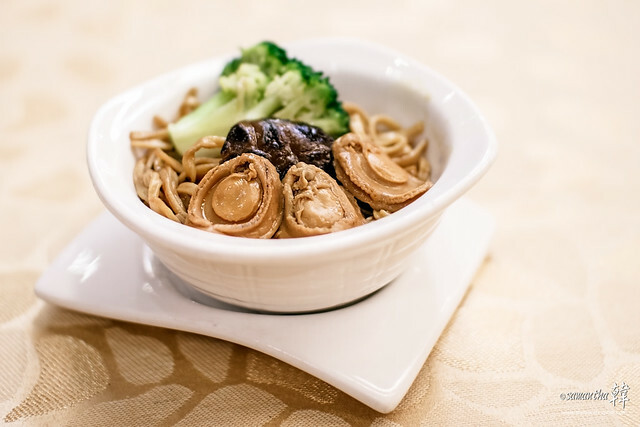 Braised Ee Fu Noodles with baby Abalone. There was cream (more like evaporated milk) already mixed into the dessert so Adrian’s mom who is intolerant to milk and cheese had a different treat. Gwai Ling Go for Mrs. Oh. 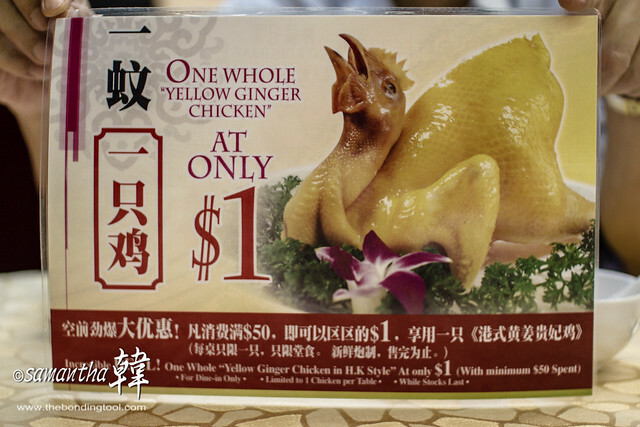 Adrian’s mom had bought this Yellow Ginger Chicken before and loved it. However, we could not buy the chicken tonight as this promotion is meant for a la carte diners with a minimum spending of S$50. Miscellaneous Bill totalled S$12.71 absorbed by Yap. 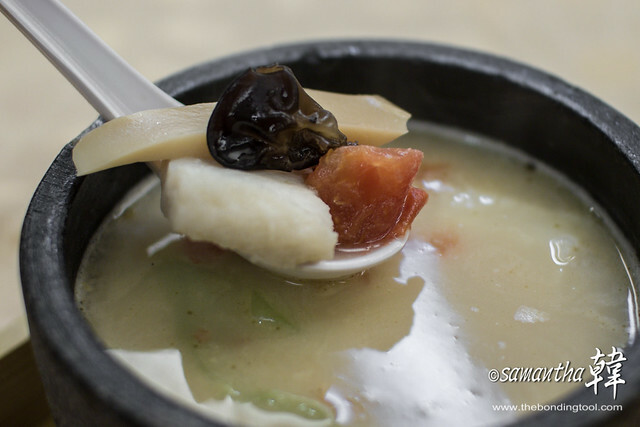 The most memorable dish we had here is the Hotstone Fish Soup. The fish was so fresh, I suspect them to be live fish from the tanks displayed outside the restaurant. All of us tilted the heavy stone to scoop the last drop. “You think there’s msg?” I asked. “Definitely!” replied Mrs. Oh nonchalantly. 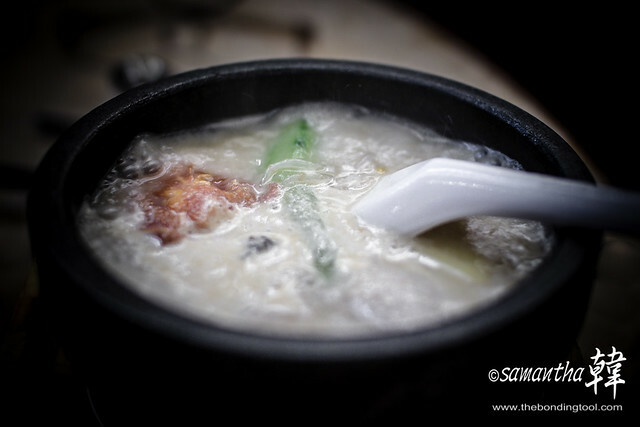 Despite the msg, most of the dishes were well executed, living up to the name of Ah Yat’s restaurants. The pace of serving was well timed and we did not feel rushed. The restaurant was packed inside but no one was sitting outdoors. The grease level in the dishes was acceptable, to me at least. The vegetables retained crunchiness. The slightly dry crab item was delicious but could do better. The braised noodles I felt was not as tasty as other Ah Yat’s outlets. Seasonings in all dishes here were well balanced. 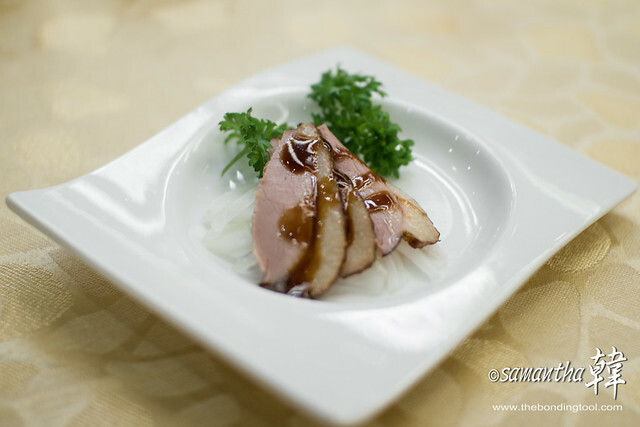 I would have preferred braised Teochew goose instead of smoked duck but that’s not the deal. 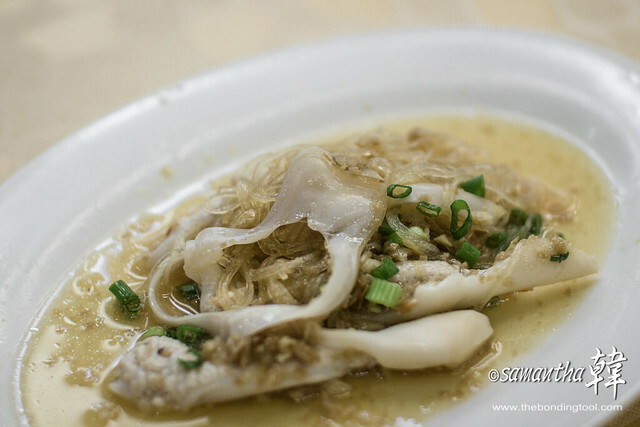 I’ll simply have to come back for their Teochew dishes another day. Overall, we had a very satisfying and value-for-money dinner with Groupon voucher at S$29.80 each (I saw set meals starting from S$68 per pax). I’ll be on the lookout for more deals! P.S. Restaurant has closed down! You can read about Adrian’s housewarming party here.